Miniature human organs made by 3D printing could create a “body on a chip” that enables better drug testing. That futuristic idea has become a new bioprinting project backed by $24 million from the U.S. Department of Defense. The 2-inch “body on a chip” would represent a realistic testing ground for understanding how the human body might react to dangerous diseases, chemical warfare agents and new drugs intended to defend against biological or chemical attacks. Such technology could speed up drug development by replacing less-ideal animal testing or the simpler testing done on human cells in petri dishes and perhaps save millions or even billions of dollars from being wasted on dead-end drug candidates that fail in human clinical trials. “The question is whether can you have a better system to test these drugs, so that you can bypass cell testing and animal testing by going straight to miniature organs,” said Tony Atala, director of the Wake Forest Institute for Regenerative Medicine in Winston-Salem, N.C.
“We’re printing miniature solid organs: miniature livers, hearts, lungs and vascular structures (blood vessels),” Atala said. The tiny organs intended for the “body on a chip ” project don’t represent fully functional hearts, livers and kidneys. 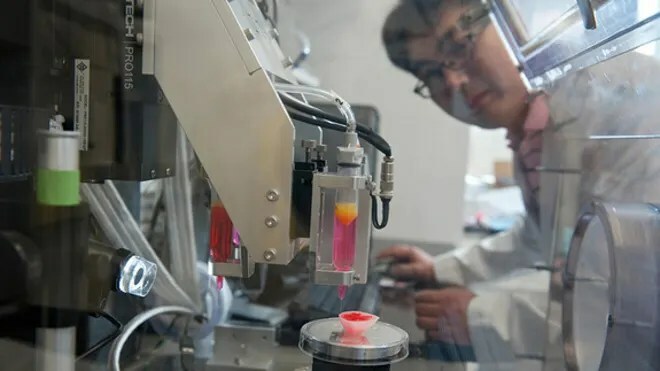 Instead, they represent small chunks of human tissue from such organs connected together by a system of fluid channels that circulate blood substitute to keep the cells alive all placed on a 2-inch (5 centimeters) chip with sensors to monitor everything. The Wake Forest Institute for Regenerative Medicine is leading the $24-million effort funded by the Space and Naval Warfare Systems Center, Pacific (SSC Pacific), on behalf of Defense Threat Reduction Agency (DTRA). But the group of experts building the “body on a chip” also hails from Brigham and Women’s Hospital in Boston, the University of Michigan, the U.S. Army Edgewood Chemical Biological Center, Morgan State University in Baltimore, and the Johns Hopkins Bloomberg School of Public Health. Together, they hope to create a drug development tool for the 21st century that helps modern medicine rapidly respond to fast-moving pandemics or bioterrorism attacks. “We will know not just how a drug affects one organ, but how a drug affects major body systems together in a chip,” Atala said. Wow, what a world we live in! !